So I know what you’re thinking. If you’ve been paying any attention to my blog there’s been a lot of posts about Christmas. The truth is I’m at least a quarter Jewish (in my mind). Ok so my step father is Jewish and I lived in Israel for a year. Plus potato pancakes were one of the first recipes I learned to make as a kid. I was probably about five or six when I learned the recipe in school. 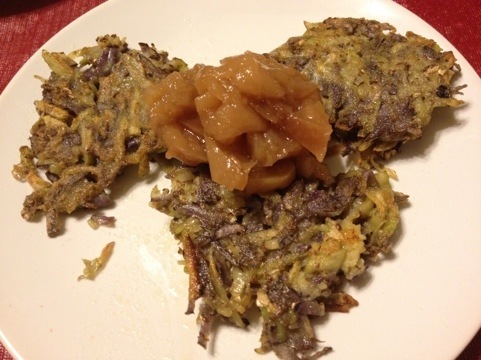 After I learned to make them my mom and I would make latkes and applesauce all the time. 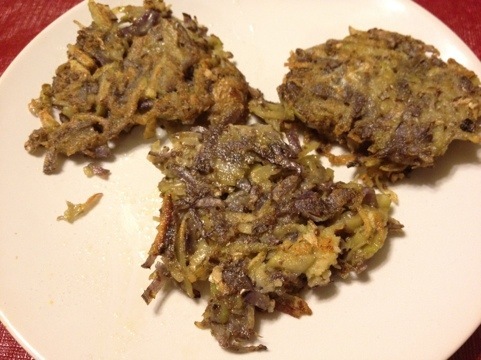 There are two basic style of latke. There are shredded and mashed potato style. The easiest by far are the shredded and this is the recipe I first learned to make as a little girl. For my latkes today I substituted flax meal for the flour to make my latkes gluten free plus they’re a little bit healthier and you don’t miss the flour one bit you really just need something to act as a binder. So here’s my slightly modified latke recipe. 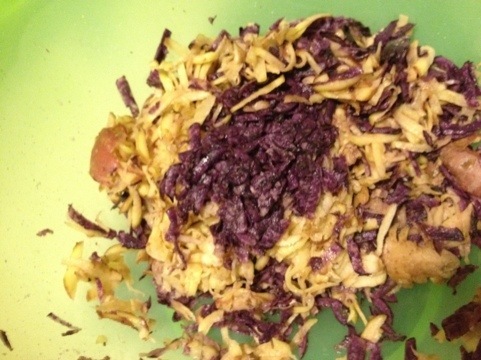 I had an assorted bag of fingerling potatoes there were purple, red, gold, and white potatoes. I shredded them with a cheese grater until I had about two cups. I mixed in two cloves of garlic minced, two tablespoons of flax seeds, and two eggs. In a frying pan I heated my oil until it pops. The key to good latkes is hot oil. I used a tablespoon sized spoon to scoop my latke mixture into the frying pan. Then just cook until their golden brown. I cut and core my apples leaving the skin on and place them in a sauce pan. I add about a half a cup of sugar to start the apples cooking. I cook my apples on medium low heat with the cover on until their soft. 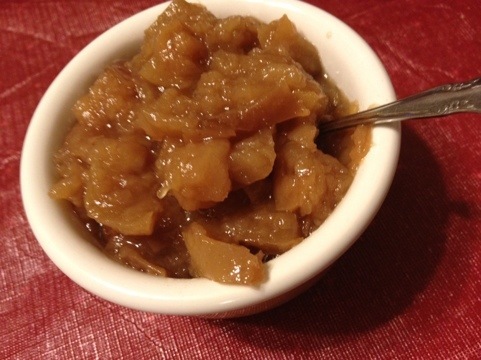 Once your apples have become sauce add sugar and cinnamon to taste. So easy and so yummy! You can use any apples you want. The amount of sugar will change depending on the type and amount of apples you use. Thanks for the ideas Dawn! I love latkes! Two questions: can i use whole wheat flour since I can’t get ground flax seed here, or maybe garbanzo bean flour? Also do you need to put water in with the apples? You can absolutely use wheat or garbanzo or any kind of flour you like. It’s just acting as a binder, together with the egg, that’s what holds the latkes together. For the applesauce you can add a little water it won’t hurt anything. The sugar should draw the juice out of the apples so you shouldn’t haVe to add water. If for some reason your apples just aren’t all that juicy and they don’t start to release their juices a little water will help and like I said it doesn’t hurt anything to put a little on. Thanks I just saw your reply when I came to look at your new recipe! I’m going to try it tonight. Your blog is fantastic — you could be the next (cool, earth momma Gen X style) Martha Stewart!